Here's my guide to sights and attractions in Rome. The vast majority of them I have personally visited and some I have received tips from others. All the attractions and sights have a description, and for most of them thera are some photos to see and more in-depth facts to read. I have also tried to provide tourist - informaiton with differnet facts as opening times and cost for the attraction. The prices may have changed since I last visited the Rome. Have you recently been to Rome and discovered any errors in the information on this webbpatse, please contact me so I can correct it if necessary. Of course there is much more to discover and experience in Rome then I show you here and I gratefully accept tips and photos if you have something you want to share. Hope you enjoy the sights and attractions of Rome! P.S I will keep updating with more sights and attractions soon so stay tuned! 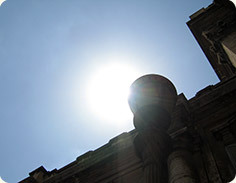 The sun caresses the eaves in Rome at St. Peter's Basilica. One of the many attractions you don't want to miss on your trip to Rome.